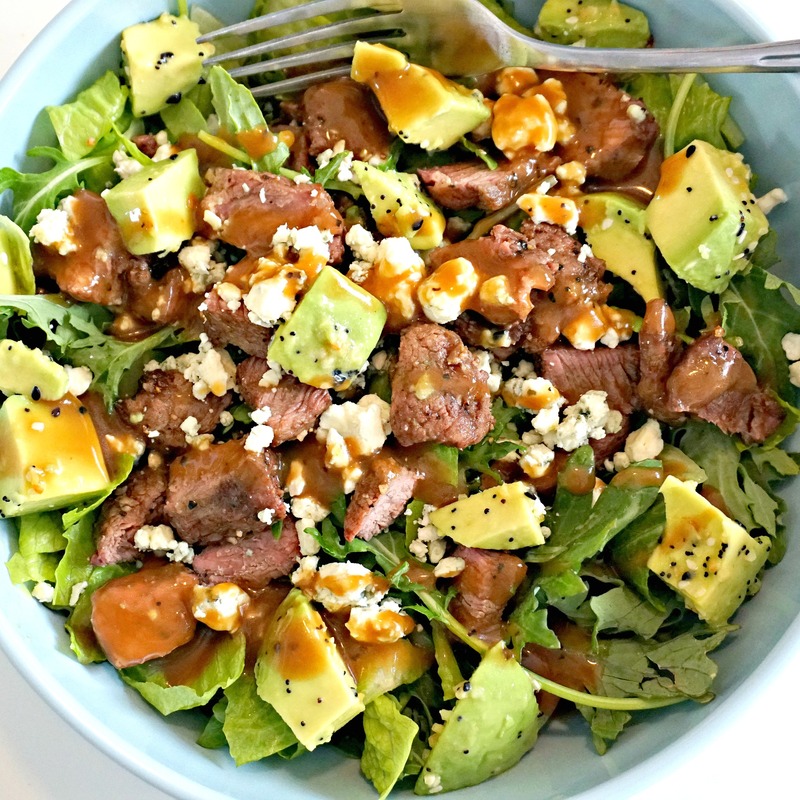 One of my favorite flavor combinations is steak and blue cheese with a touch of balsamic vinaigrette! They go perfectly together, and when combined with baby kale and some avocado…it is to die for! 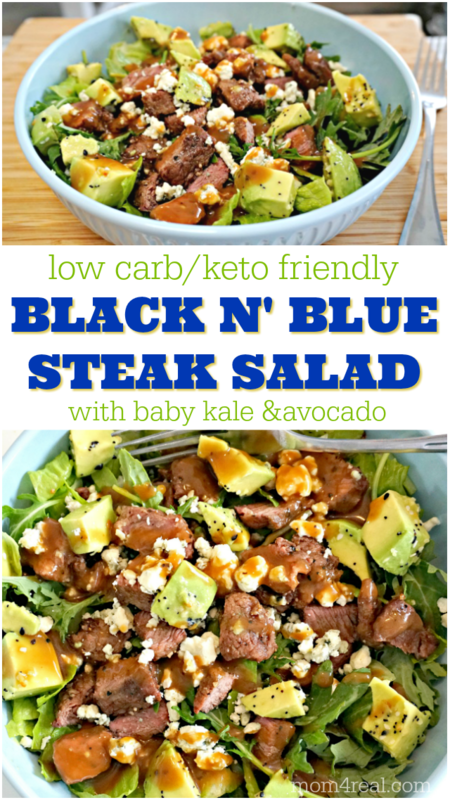 This Black n’ Blue Steak Salad is low carb, keto friendly, super filling and oh so delicious! This salad is hearty ya’ll, and I’m not usually a salad lover. I’ve been eating pretty low carb for a little over two months now, and one of the things that I have struggled with is finding different things to eat. It’s the key to eating healthy for me. If I eat the same thing every day, I will not be able to sustain a lower carb lifestyle, and to be honest I feel so much better when I cut out all of the gluten and most carbs. 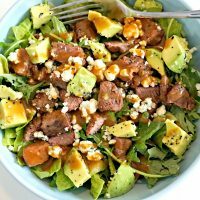 The secret to this salad is all in the steak! I’ll tell you, here in Kentucky, we’ve had rain almost every day for the past year…it’s been a little tough to grill most nights, so I hadn’t cooked any steaks for a while. I recently started using an air fryer to cook some things inside, and recently shared my Air Fryer Mini Burgers with Cheese, which was a total game changer for me! They turned out perfect, so I decided to try cooking steak bites in the air fryer. I honestly didn’t have high hopes for them, but HOLY AMAZING! They turned out sooo juicy, delicious and full of flavor. Now I can enjoy steak in my favorite black n’ blue salad whenever I like, and I couldn’t be happier! 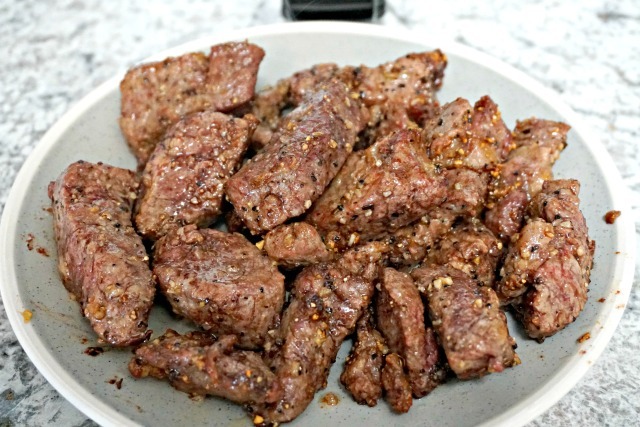 You can see How to Cook Steak Bites in an Air Fryer HERE! Now, on to the Black n’ Blue Salad Recipe! If you are a long time reader here, then you know that I like to make things as easy as possible, especially when it comes to meal prep. For this salad, I use a store bought balsamic vinaigrette. I am learning to make my own salad dressings, but haven’t found one that I love as much as the Marzetti Simply Dressed Balsamic Vinaigrette. If you have a great balsamic vinaigrette recipe, I’d love for you to send it to me at jessica@mom4real.com ! Add the baby kale or arugula to a large bowl. Top with the steak bites, avocado and blue cheese crumbles. I like to sprinkle the salad with Trader Joe’s Everything But the Bagel Seasoning at the end…it’s a blend of sesame seeds, sea salt, garlic, onion and poppy seeds, and I am obsessed with it!